The Cassini spacecraft captured this impressive view on Saturn on 2004 December 14 from a distance of 447,000 miles (719,000 kilometers). The image shows the planet's banded atmosphere and icy rings. Saturn's moon Titan, with its thick, orange-colored atmosphere, appears in the lower right. Image courtesy of NASA/JPL/Space Science Institute. (DEC 26) Clearfield, Utah - The U.S. Air Force this week awarded Northrop Grumman two contracts to modernize the Minuteman III strategic missile. The vehicle is the mainstay of the U.S. land-based strategic missile force and work performed under the contracts is intended to extend the missile's service life through 2020. The firm received a $153 million contract to continue full-rate production of the intercontinental ballistic missile (ICBM) Guidance Replacement Program (GRP). This program is a key modernization effort that will upgrade the missile's guidance system electronics. Northrop Grumman was also awarded a $248 million contract to continue the full-rate production phase of the intercontinental ballistic missile (ICBM) Propulsion Replacement Program (PRP). The program replaces aging Minuteman III stage 1, 2, and 3 solid rocket motors with remanufactured motors. The remanufacturing includes replacing the aging propellant and obsolete or environmentally unsafe materials and components. Information courtesy of Northrop Grumman. This true-color image of Antarctica's Ross Sea was acquired by the MODIS instrument on NASA's Terra satellite on 2004 December 13. The dark area is the Ross Sea and the white "islands" are icebergs. Frozen McMurdo Sound is the bluish white area to the left. 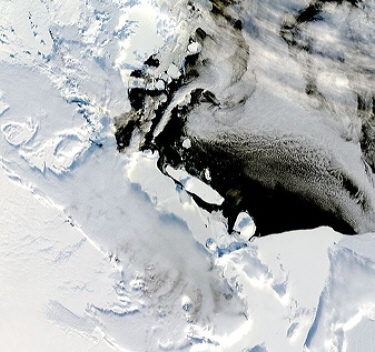 During the Antarctic summer, thick sea ice is normally released from the Ross Sea and McMurdo Sound, but this year the process is being hampered by the presence of a 1,200-square mile (3,000-square kilometer) iceberg. The ice in the sound may cause penguins to starve because of the distance they must travel to reach open waters and food. The frozen sound also presents problems for supply ships scheduled to bring supplies to the United States' McMurdo Base and New Zealand's Scott Base. Image courtesy of Jeff Schmaltz, MODIS Land Rapid Response Team, NASA GSFC. (DEC 19) The Ursids, a lesser-known and little understood meteor shower, are expected to peak on Wednesday morning, December 22. According to meteor expert Gary Kronk, the event typically produces a maximum of five to ten meteors per hour with occasional outbursts of 100 or more. The Ursids' radiant - or place from which the meteors appear to originate - lies in the constellation Ursa Minor (otherwise known as the Little Dipper. To see this relatively unknown display, look towards the north on Wednesday between midnight and morning twilight. 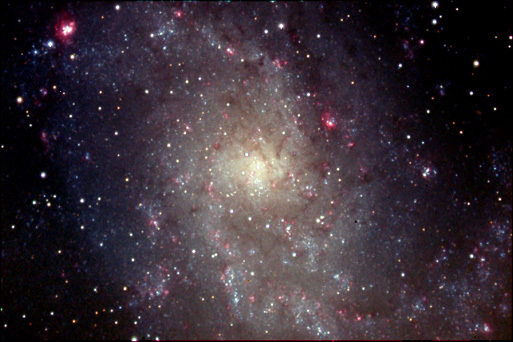 Robert Kuberek took advantage of clear skies and a new Moon to record this view of M33 (also called the Pinwheel Galaxy) from southern California's Lockwood Valley. 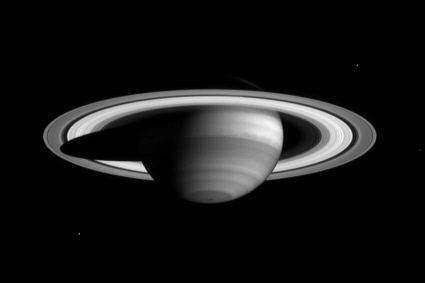 The photo is a composite of four exposures totaling 95 minutes taken with a 7-inch refracting telescope and a CCD camera. Image copyright 2004, Robert Kuberek. Used with permission. (DEC 12) The annual Geminid meteor shower reaches its peak early next week. Weather permitting, observers in the Southwest can expect to see several meteors per hour between 22:00 local time and dawn on the night of December 13-14. Although the display is best seen from a dark location far from city lights, observers in the suburbs should also be able to see the fleeting meteors, but not just as many. To observe the Gemininds, dress warmly and recline in a lawn chair. Look in the east before midnight, high in the south during the early morning, and in the southwest before dawn. Meteor watching doesn't require any special equipment and the best view will be had with the naked eye. 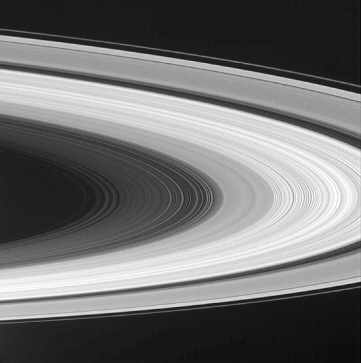 Any doubts about the grandeur of Saturn's rings will be dissolved by sweeping portraits like this infrared image from Cassini which captures almost the entire ring system. (DEC 3) The Missile Defense Agency and Vandenberg AFB's 30th Space Wing are set to emplace the base's first anti-missile interceptor in a silo at North Vandenberg on Tuesday. Two interceptors, intended for long-range missile defense, are planned for emplacement at Vandenberg by year's end. They will compliment six similar interceptors now emplaced at Ft. Greely, Alaska. Once operational, the interceptors will be integrated with radars and other sensors to an extensive command, control, battle management and communication system with primary components in Colorado Springs, Colo., and Ft. Greely. Two additional silos at Vandenberg have been modified to launch interceptors during realistic flight tests and could also be used for additional operational interceptors. 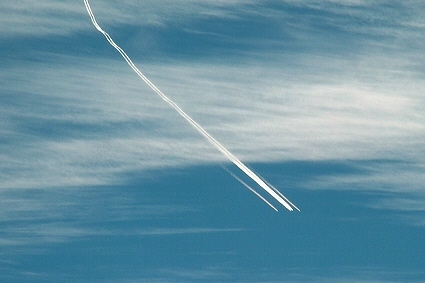 Contrails from chase planes and a B-52 bomber carrying NASA's X-43A research vehicle as they head to the launch point prior to the vehicle's record-breaking flight on November 16. Jay McKee took this image from Newbury Park as the aircraft flew offshore prior to release of the unmanned X-43A southwest of Point Mugu. A rocket sent the craft to a height of 111,000 feet and the X-43A's scramjet engine powered it at Mach 9.6 - a record for an airbreathing vehicle. Image copyright 2004, Jay McKee. Used with permission. (NOV 27) Saturn's moon Titan reaches its greatest separation from the planet this Thursday morning. Known as "western elongation", Titan will lie a fraction of a degree to the west of the ringed planet and should be visible in tripod-mounted binoculars or a small telecope. (NOV 24) After seven months of improvements, the Ott Planetarium, located in Lind Lecture Hall on Weber State University's Ogden campus, will re-open Dec. 1 with two new shows. The planetarium closed in May in order to upgrade its sound system to a 5.1 digital theater. It also added a full dome, digital projection system. "The Sky Tonight," a live show about current astronomical events, will start at 6:30 p.m., followed by "Legends of the Night Sky: Orion," an animated feature that discusses the constellation's legend. Both shows will continue to run each Wednesday until Dec. 22, when the planetarium will break for the holidays. Shows recommence Jan. 12. Admission is $1 for students and $2 for everyone else. In addition, the WSU physics department hosts a free star party every Wednesday at 8:30 p.m., north of Lind Lecture Hall. View from space of the November 7 aurora (white band). This nighttime image was captured in visible light by the Air Force's DMSP F16 military weather satellite. The spacecraft was launched from Vandenberg AFB in 2003. Image courtesy of U.S. Air Force. (NOV 21) It's one of Earth's closest neighbors, but many people have never seen it because it never ventures very far from the Sun. Elusive Mercury attained its greatest angular separation from the Sun yesterday and is now visible to the naked eye low in the west at dusk. To catch a glimpse of this mysterious planet, observers in southern California and surrounding areas should find a location with an unobstructed western horizon and look in the southwest about 25 minutes after sunset. Mercury will look like a semi-bright "star" approximately 7 degrees above the horizon. If you want to see the planet, don't delay - it will only be visible for the next few evenings. 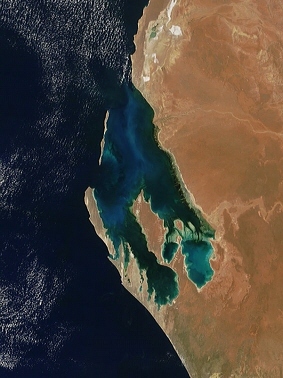 Clouds of phytoplankton streak through the northernmost waters of Shark Bay in Western Australia. The cloud makes bright blue streaks against the deep black clear waters, while further in the bay the water appears turquoise because of shallow water and light sediment. This image was captured by NASA's Terra satellite on November 6. Terra was launched from Vandenberg AFB in 1999. Image courtesy of NASA. (NOV 14) Preparations are underway at Edwards AFB for Monday's record-breaking flight of NASA's X-43A. Chase planes and a B-52 carrying the unmanned craft will leave Edwards AFB, cross the coast at Gaviota, and proceed to the launch point west of Los Angeles. The X-43A will be released high above the Pacific and boosted to an altitude of 110,000 feet by a solid rocket motor. The rocket will fall away and the X-43A's scramjet engine will briefly power the vehicle at Mach 10 - a world record. The X-43A will then make a series of turns before plunging in the sea. The B-52 is slated to leave Edwards AFB at 13:00 PST with the launch taking place about an hour later. If the weather is clear, observers in the coastal portions of Santa Barbara, Ventura, and Los Angeles counties may spot the B-52 and chase planes on their way to and from the launch point. (NOV 9) The Cosmos 1 team announced today that the world's first solar sail spacecraft is set for launch on March 1, 2005 from a submerged submarine in the Barents Sea. Cosmos 1 - a project of The Planetary Society - is sponsored by Cosmos Studios. Digital photo taken by California astroimager Jason Hatton during the total portion of October 27th's total lunar eclipse. 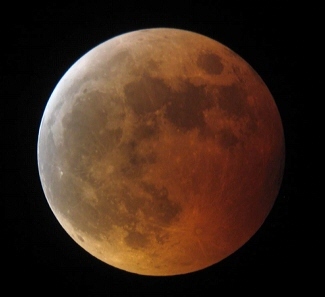 During totality the normally gray Moon was indirectly illuminated by sunlight filtering through the Earth's atmosphere, giving it a reddish-orange color. Hatton captured this image using a C9.25 Schmitt-Cassegrain telescope and Canon Powershot A75 digital camera. Image copyright 2004, Jason Hatton. Used with permission. (NOV 3) Due to weather concerns and scheduling conflicts for use of the U.S. Navy's test range off the Southern California coast, the third and final flight of the X-43A hypersonic research aircraft from NASA's Dryden Flight Research Center has been rescheduled for no earlier than Monday, November 15 with November 16 as a backup date. The mission is intended to flight-validate the operation of the X-43A's supersonic-combustion ramjet ("scramjet") engine at an airspeed of almost Mach 10 or about 6,800 mph. Technicians are preparing the research vehicle and its rocket booster for mating to the B-52B launch aircraft, and project engineers are completing control room training for the mission, simulating both a nominal mission and a variety of contingencies that could arise during the flight. The flight should be the last research mission for NASA's venerable B-52B launch aircraft, which is scheduled for retirement after almost 50 years of service. (NOV 3) Weather permitting, sky watchers can view a close planetary encounter before sunrise Thursday morning. As seen from the Southwest, Venus and Jupiter will be separated by less than a degree when they rise in the east about three hours before sunrise. The two planets will gradually move closer until 12:41 PST (20:41 UTC) tomorrow when they are just 0.6 degrees apart. To see the encounter, look in the east just before dawn. Venus will look like a dazzling silver-white "star" while nearby Jupiter will resemble a fainter, ivory-colored speck. False color image of Saturn's moon Titan taken during Cassini's fly of the satellite on October 26. The image was constructed from four images acquired through different color filters. Red and green represent infrared wavelengths and show areas where atmospheric methane absorbs light. These colors reveal a brighter (redder) northern hemisphere. Blue represents ultraviolet wavelengths and shows the high atmosphere and detached hazes. Image courtesy of NASA/JPL/Space Science Institute. (OCT 31) Solar activity increased this week with the appearance of two sunspot groups and several solar flares. 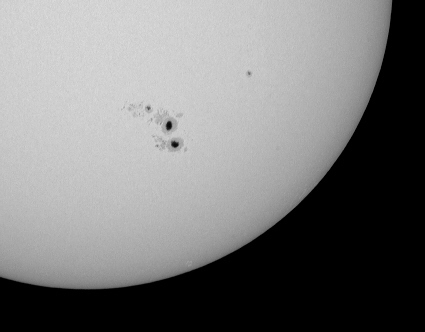 The sunspot groups, called active regions 0691 and 0693, are reportedly visible using proper protection and the naked eye. On October 30, fast-growing active region 691 unleashed several strong solar flares. Some of these explosions may be heading towards Earth and could result in auroras in the Earth's high-latitude regions. (OCT 28) This morning's scheduled launch of a Pegasus XL rocket carrying the DART satellite was scrubbed because of the discovery of contamination within the rocket's payload shroud. A new launch date has not been officially announced, but the launch could be rescheduled for early November. 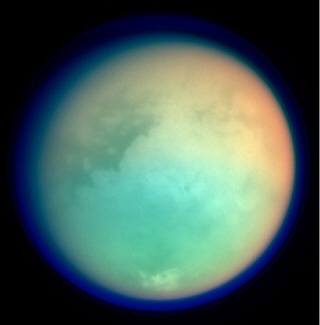 (OCT 27) Early analysis of images and other data captured during last night's close flyby of Saturn's moon Titan by the Cassini spacecraft reveals greater surface detail than ever before and shows that Titan has lost much of its original atmosphere over time. 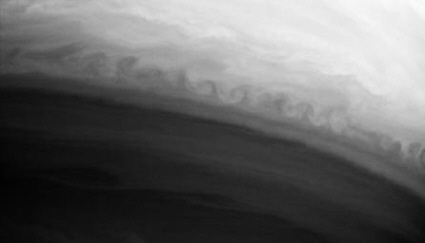 This Cassini infrared image shows the turbulent boundary between two latitudinal bands in Saturn's atmosphere. The ragged pattern is an example of a Kelvin-Helmholtz instability, which occurs when two fluids of different density flow past each other at different speeds. The image was taken on October 9 from a distance of 3.7 million miles (5.9 million kilometers). Image courtesy of NASA/JPL/Space Science Institute. (OCT 24) The Southwest will be treated to a total eclipse of the Moon this Wednesday, October 27. The eclipse begins when the Moon's orbit carries it into the Earth's shadow, creating a dent on the Moon's edge. The dent will gradually grow larger over the next hour until the start of totality at 19:23 PDT. For the next 1 hour 22 minutes, the Moon will be completely within the shadow and indirectly illuminated by sunlight filtering through the Earth's atmosphere. During totality, the Moon may range in color from yellow to dark brown. The Moon's brightness and color are difficult to predict and will depend on the amount of dust in the Earth's atmosphere. After totality, the Moon will slowly emerge from the shadow until the eclipse ends at 21:54 PDT. The following table lists the times of the eclipse's main events. Weather permitting, the eclipse should be visible to the unaided eye. The see it, look in the east beginning at 18:14 PDT. For observers on the West Coast, the Moon may be anywhere from on the horizon to just above it when the eclipse begins. 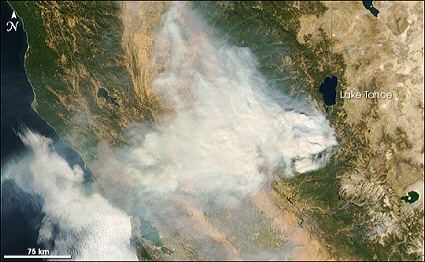 This satellite image shows the combined smoke from the Freds and Power Fires in northern California southwest of Lake Tahoe. It was captured by the Moderate Resolution Imaging Spectroradiometer (MODIS) on NASA's Aqua satellite on October 14. Aqua was launched aboard a Delta II rocket from Vandenberg AFB in 2002. Image courtesy of NASA. (OCT 14) NASA has declared Aura, the newest Earth Observing system (EOS) satellite operational. The Northrop Grumman built spacecraft has begun providing the most comprehensive space-based measurements ever of atmospheric gases. Northrop Grumman turned over the symbolic "key" to the spacecraft in a ceremony today at Goddard Space Flight Center in Greenbelt, Md. Aura will be operated by engineers and technicians stationed at Goddard's mission control center for the next six years. 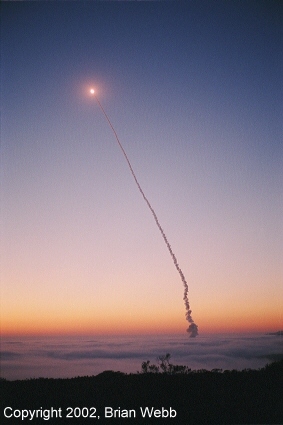 Aura was launched during the early morning of July 15 from Vandenberg AFB. 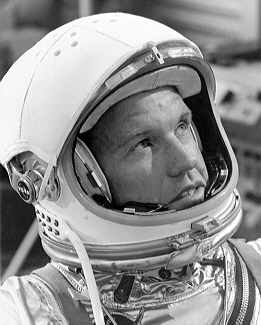 Space pioneer Gordon Cooper died October 4 in Ventura, California at age 77. Born in Shawnee, Oklahoma, he served in the U.S. Air Force as a pilot, test pilot, and astronaut. One of the original Mercury astronauts, Cooper piloted the final flight in project Mercury and served as command pilot of the Gemini 5 mission and logged a total of 222 hours in space. He retired from the Air Force and NASA in 1970. Image courtesy of NASA. (OCT 5) Space Exploration Technologies Corporation (SpaceX) has transferred the Falcon I flight vehicle to its launch complex at Vandenberg Air Force Base. The vehicle will now undergo a series of pre-launch tests. When it launches, Falcon I will carry the TacSat-1 satellite to a 500 km orbit (100 km above the International Space Station) with a southeast departure track along the California coast. TacSat-1 is built and integrated by the US Naval Research Laboratory for the Defense Department's Office of Force Transformation. In addition to TacSat-1, SpaceX has two other launches of Falcon I and one launch of Falcon V under contract for 2005. 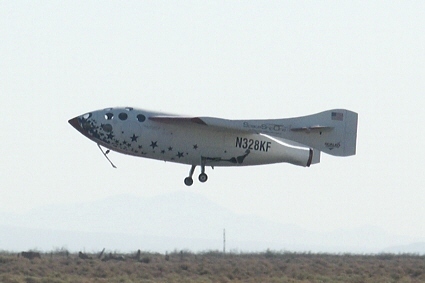 Scaled Composites' SpaceShipOne lands at Mojave, California on Wednesday following the first of two qualification flights for the Ansari X-Prize. During the flight, pilot Mike Melvill flew the craft to a maximum altitude of 337,500 feet (102,870 meters). On October 4, Scaled Composites will attempt to win the $10 million prize by completing a second flight. Photo Copyright 2004, John Sanford. Used with permission. (OCT 1) This Sunday morning skywatchers have a chance to see a close encounter between Venus and the bright star Regulus. The two objects will move closer over the next day and a half until October 3 at 08:01 PDT (15:01 UTC) when they are separated by 0.15°. To view the event, observers in the Southwest should look in the east just before dawn on Sunday and locate brilliant, silvery-white Venus. Regulus will be immediately to the planet's left. 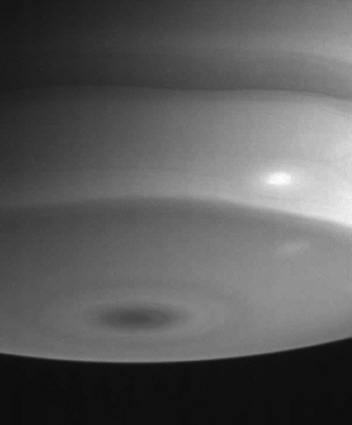 Time-lapse movie showing NASA's MESSENGER spacecraft enroute to the planet Mercury. Astrophotographer Fred Bruenjes created this movie from images he captured from Ramona, California on the evening of August 3, one day after launch. At the time, MESSENGER was 400,000 km away (about the same distance as the Moon). Bruenjes' equipment consisted of an 8-inch Meade Schmidt-Cassegrain telescope and SBIG ST-7XME CCD camera. Copyright 2004, Fred Bruenjes. Used with permission. 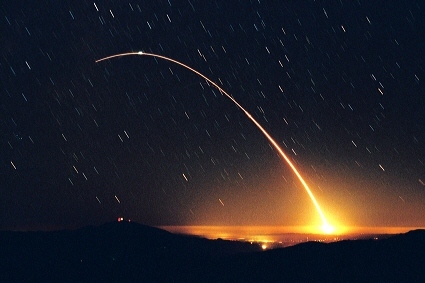 Time exposure photo of Wednesday morning's Minuteman III test launch from Vandenberg AFB. The missile sent three unarmed warheads 4,800 miles downrange to the impact area in the central Pacific. 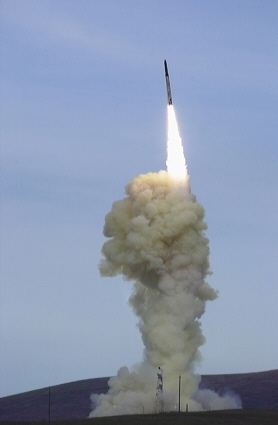 The launch was conducted to gather information on the reliability and accuracy of the Minuteman III force. This photo was taken by the webmaster from the mountains north of Santa Barbara. The short lines are star trails caused by the Earth's rotation. Copyright 2004, Brian Webb. 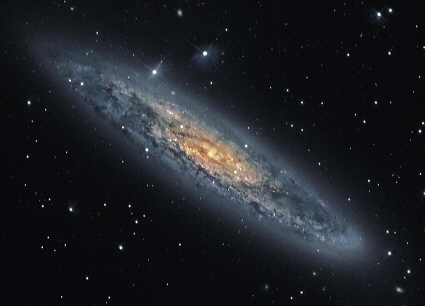 Amateur astronomer George Greaney captured this view of NGC 253, a galaxy in the constellation Sculptor. This image is actually a sandwich of four images taken late last month from Ash Meadows, Nevada. Greaney used a 14.5-inch Ritchey-Chretien telescope and an SBIG STL-11000M CCD camera. Copyright 2004, George Greaney. Used with permission. The MODIS instrument aboard NASA's Aqua satellite captured this true-color image of Hurricane Frances on September 3 at 11:24 PDT (18:24 UTC). 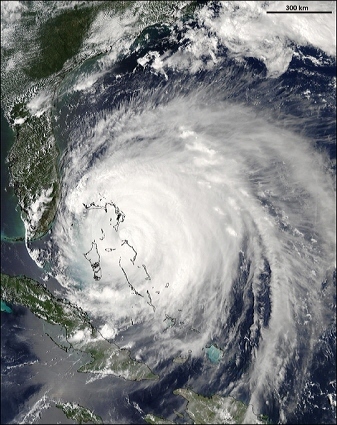 At the time this image was acquired, Frances was wreaking havoc in the Bahamas with sustained winds of 115 miles per hour (185 kph) and a storm surge between 6 to 14 feet (1.8 to 4.3 M). 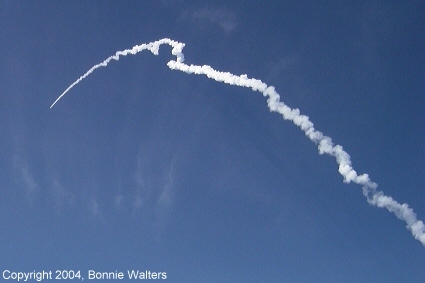 Aqua was launched aboard a Delta II rocket from Vandenberg AFB on 2002 May 4. Image courtesy of NASA. (SEP 4) Three years after it lifted-off to capture samples of the solar wind, NASA's Genesis spacecraft is scheduled to return to Earth next Wednesday morning. If all goes well, a helicopter will snag the spacecraft in mid-air above the salt flats of Utah at about 09:15 PDT (16:15 UTC). NASA TV is available at www.nasa.gov/ntv and via satellite in the continental U.S. on AMC-6, Transponder 9C, C-Band, at 72 degrees west longitude. The frequency is 3880.0 MHz. Polarization is vertical, and audio is monaural at 6.80 MHz. In Alaska and Hawaii, NASA TV is available on AMC-7, Transponder 18C, C-Band, at 137 degrees west longitude. The frequency is 4060.0 MHz. Polarization is vertical, and audio is monaural at 6.80 MHz. To access JPL's webcasts, visit www.jpl.nasa.gov/webcast/genesis. This Cassini spacecraft narrow angle camera view of Saturn's southern polar region features a bright white spot, or storm, surrounded by faint, darker swirls of clouds. This infrared image was taken from a distance of 4.2 million miles (6.7 million kilometers) from the planet. Image courtesy of NASA/JPL. (AUG 28) Early risers have an opportunity to see a close planetary alignment before dawn next week. Over the next few days, Venus and Saturn will move closer until Tuesday morning when they are separated by less than two degrees. To view the alignment, observers in the Southwest should go outdoors on August 31 between 04:00 and 05:00 local time and look east. Venus will resemble a dazzling white "star". Saturn will lie just to the north and look like a fainter dusky speck. Closest approach - 1.9 degrees - occurs later that morning at 09:07 PDT (16:07 UTC). Although the planets will appear to be near one another, they will actually be separated by about 830 million miles. Their apparent proximity will be the result of their position in the sky as seen from Earth. 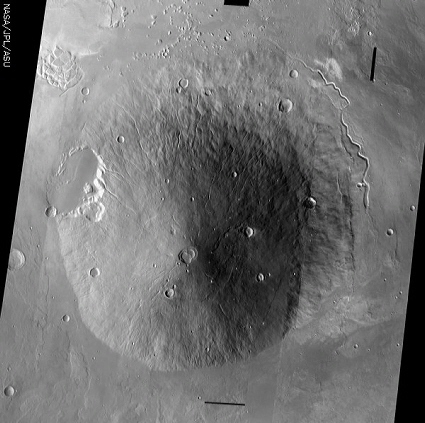 An overhead view of the Hecate Tholus, a martian volcano located north of Elysium Mons. The image above is a mosaic of daytime IR images taken by the THEMIS instrument on NASA's 2001 Mars Odyssey spacecraft. Image courtesy NASA/JPL/Arizona State University. (AUG 17) Raytheon reports that the firm's Tucson, Arizona facility has delivered the first production Exoatmospheric Kill Vehicles (EKVs) for the U.S. Ground-Based Midcourse Defense (GMD) system. The EKVs, which will be mounted on ground-based interceptors, are designed to destroy ballistic missiles as they fly through space during the middle (mid-course) phase of flight. The kill vehicles are the first of 20 scheduled for delivery over the next two years for deployment at Fort Greely, Alaska, and Vandenberg Air Force Base, California. A common sight for observers further north, the Northern Lights are sometimes visible from the Southwest. 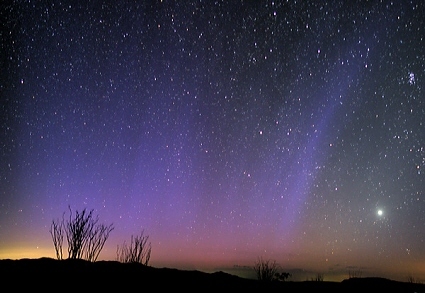 Astronomy author and photographer Dennis Mammana photographed this pre-dawn aurora (blue streaks and pink band) from southern California's Anza-Borrego Desert State Park on July 27. The bright object in the lower right is Venus. Copyright 2004, Dennis Mammana. Used with permission. (AUG 15) The planet Venus rises about 3-1/2 hours before the Sun for observers in the Southwest and shines brightly at magnitude -4.3. The planet, which attains its greatest angular separation from the Sun on Tuesday, is now conveniently placed for observation in the east at dawn. Venus is currently 23.8 seconds in diameter and a modest telescope should reveal the planet's half-Moon appearance. As NASA's Opportunity Mars rover creeps farther into Endurance Crater, the dune field on the crater floor appears even more dramatic. Tendrils of sand less than 1 meter high extend from the main dune field toward the rover. Scientists hope to send the rover down to one of these tendrils to learn more about the dunes. Before the rover heads down to the dunes, rover drivers must determine if the slope leading to them is firm enough to drive back out of the crater. Image courtesy NASA/JPL/Cornell. (AUG 8) The annual Perseid meteor shower reaches its peak early next Thursday morning. The display occurs every August when the Earth crosses the orbit of Comet Swift-Tuttle and dust particles from the comet burn up as they collide with the atmosphere. During a typical Perseid display, observers in rural areas see a maximum of about 50 meteors per hour while those in the suburbs see about half as many. This is a good year for observing the Perseids due to minimal interference from moonlight and a real possibility that the shower may be especially intense. To view the Perseids, go outdoors on August 12 between midnight and dawn. If you're in western North America, you may want to observe around 04:00 PDT (11:00 UTC) when the shower is expected to peak. The American Meteor Society recommends viewing the event by lying in a reclining lawn chair with your feet pointing southeast and looking straight up. To the delight of solar observers, a large sunspot group crossed the Sun's face last month. Astroimager Bob Kuberek photographed the feature from Santa Clarita, California on July 25 with a 5-inch apochromatic refractor telescope, Baader filter, and Canon EOS 10D digital camera. Copyright 2004, Robert Kuberek. Used with permission. (AUG 1) An anti-ballistic missile jointly developed by the U.S. and Israel successfully intercepted a target missile off the California coast on Thursday. The target, reportedly a Scud captured by U.S. forces in Iraq, was launched from an offshore platform on the Point Mugu sea range. Five minutes later, the Arrow II interceptor was launched from San Nicolas Island. The Arrow subsequently intercepted and destroyed the Scud at an altitude of 25 miles (40 km) some 50 miles (80 km) west-southwest of the island. According to the U.S. Missile Defense Agency, the July 29 test demonstrated the Arrow II's improved performance against the type of targets that represent a threat to Israel. (JUL 31) Preparations are under way at Cape Canaveral Air Force Station for the launch of NASA's MESSENGER spacecraft to the planet Mercury. A Delta II booster carrying the probe is scheduled to lift-off on August 1 at 23:16:11 PDT. 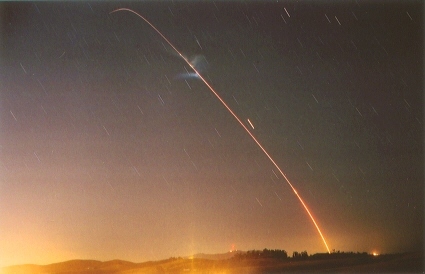 Time exposure of the July 21 launch of a Peacekeeper strategic missile from Vandenberg AFB. Believed to be the second to last Peacekeeper launch before the weapon system is retired, the test flight sent eight unarmed warheads on a ballistic trajectory to the central Pacific. This photo was taken 105 miles (169 km) east-southeast of the missile silo from Ventura County. Copyright 2004, Brian Webb. (JUL 19) An unarmed Peacekeeper intercontinental ballistic missile is set to launch from Vandenberg AFB this Wednesday during a six-hour launch window that begins at 1:01 a.m.
A Delta II rocket carrying NASA's Aura satellite lifts-off from Vandenberg AFB. This time exposure taken near Santa Cruz captures the Delta's powered flight. Copyright 2004, Rick Baldridge. Used with permission. A spectrogram of the star Vega taken on July 10. 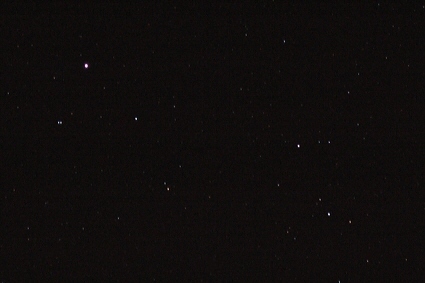 The star, located in the constellation Lyra (top), is the brightest in the summer sky. The webmaster placed a diffraction grating in front of his Nikon D70 digital camera's lens to disperse the star's light into a spectrum (bottom). The dark lines on the right are specific colors absorbed by chemical elements in Vega's atmosphere. Copyright 2004, Brian Webb. (JUL 11) The Orange County Astronomers will host AstroImage 2004 on August 27 and 28 at the Curtis Theater in Brea, California. The gathering will cover a variety of astronomical imaging topics delivered by recognized authorities in the field. This year's conference will feature a special presentation by author Robert Reeves and astronaut Don Pettit titled "Amateur Astroimaging from the International Space Station". (JUL 10) The launch of NASA's Aura atmospheric chemistry satellite from Vandenberg AFB has been delayed 48 hours due to a technical problem with the booster. The spacecraft is now scheduled to lift-off from Space Launch Complex 2 West aboard a Delta II rocket on July 13 at the start of a launch window that extends from about 03:01:57 to 03:04:57 PDT (10:01:57 to 10:04:57 UTC). 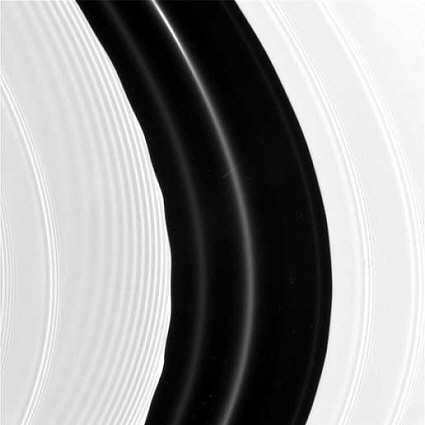 This Cassini image released on Thursday reveals intricate details in Saturn's rings including a scalloped edge and numerous arc-shaped features. 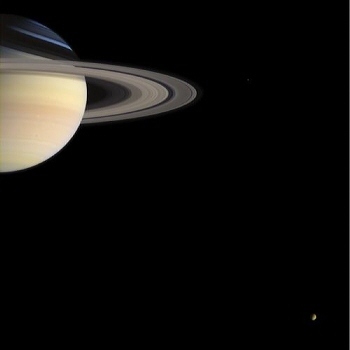 Cassini transmitted this view after becoming the first spacecraft to enter orbit around Saturn. Image courtesy of NASA/JPL. 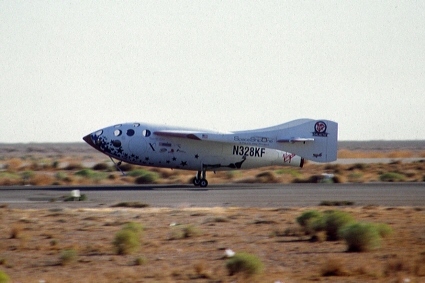 History's first privately funded manned spaceflight comes to an end as SpaceShipOne lands at Mojave, California. Pilot Mike Melvill flew the rocket plane to an altitude of 62 miles (100 km) during a suborbital flight on Monday. Image Copyright 2004, Mike Schriber. Used with permission. (JUN 27) On the morning of July 1 observers within a narrow strip of the Southwest have an opportunity to see an asteroid occult a semi-bright star. At 02:54 PDT (09:54 UTC) the +12.5 magnitude asteroid 559 Nanon will pass in front of TYC 6288-01139-1, a +8.6 magnitude star. (JUN 24) On June 30, 2004, the Cassini-Huygens spacecraft arrives at Saturn for a four-year tour of Saturn, its rings, icy moons, magnetosphere, and Titan, the planet's largest moon. (JUN 21) The Air Force has scheduled a Minuteman III strategic missile for launch from Vandenberg AFB on Wednesday morning, June 23. The ICBM will probably leave its silo at north Vandenberg when the six-hour launch window opens at 01:01 PDT. The Minuteman will send an unspecified number of unarmed warheads on a ballistic trajectory to the central Pacific. Thirty minutes later the warheads should reach their targets in the Marshall Islands. The launch is being conducted by personnel from Vandenberg AFB and a visiting task force from Malmstrom AFB in Montana. The flight will test the reliability and accuracy of the Minuteman III weapon system. If the weather is clear, the launch should be visible as far away as Phoenix. 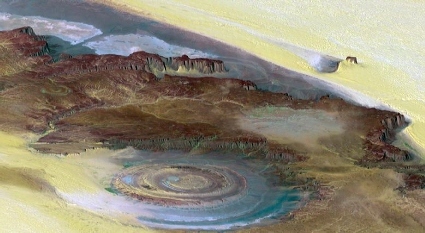 This space-based view shows a curious circular feature in the north African nation of Mauritania. Known as the Richat Structure, the feature forms a 30-mile-wide bull's-eye in a featureless expanse of desert. This view was created by combining a LANDSAT satellite image with elevation data from a radar flown on the Space Shuttle. It is part of a treasure trove of digital elevation maps of Africa and the Arabian Peninsula recently made available by NASA and the National Geospatial-Intelligence Agency. Image courtesy of NASA/JPL/NGIA. 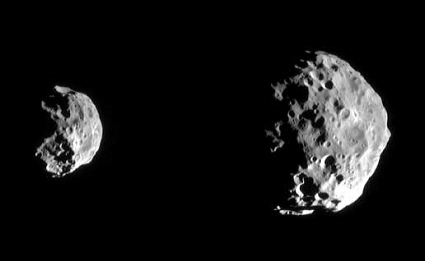 Early images from the first detailed reconnaissance of Saturn's small outer moon, Phoebe. Left to right, the two views were obtained from distances ranging from 88,918 miles (143,068 kilometers) to 48,130 miles (77,441 kilometers). Phoebe has revealed itself to be a rugged, heavily cratered body, with overlapping craters of varying sizes. These characteristics suggest an old surface. Cassini's closest approach to Phoebe was approximately 1,285 miles (2,068 kilometers). Image courtesy of NASA/JPL/Space Science Institute. Saturn reveals a wealth of detail in this near infrared image taken by Cassini on 2004 May 10. This view shows white feathery clouds near 45° south latitude and disturbances around the eastern edge of the south polar collar. The image was taken with the spacecraft's narrow angle camera from a distance of 16.9 million miles (27.2 million kilometers) from Saturn. Image courtesy of NASA/JPL/Space Science Institute. This close-up of an image from NASA's Aqua spacecraft shows the Peppin Fire on El Capitan Mountain in New Mexico. 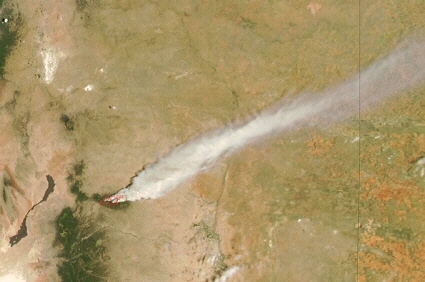 The blaze erupted on May 15 and was nearly contained before it roared back to life due to dry conditions and strong winds. The image was captured on May 24 by the spacecraft's MODIS instrument. Aqua was launched from Vandenberg AFB in 2002 May. Image courtesy of NASA. 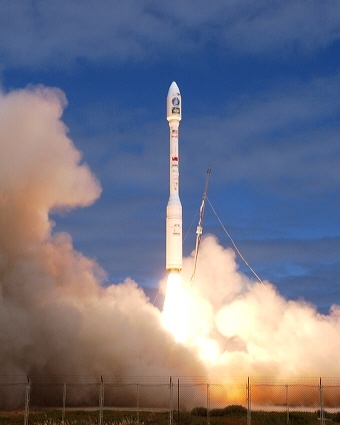 A Taurus rocket carrying Taiwan's ROCSAT-2 satellite lifts-off from Vandenberg AFB. The May 20th launch successfully inserted the spacecraft into an initial 447 x 461 mile (720 x 742 km) orbit inclined 99.1° to the equator. Image courtesy of U.S. Air Force. (MAY 16) Comet C/2001 Q4 NEAT has climbed higher into the evening sky for northern hemisphere observers and is still easily visible from the suburbs using binoculars. It may also be visible to the naked eye under very dark skies. During the next five days the comet will continue to climb as it moves from Cancer into Lynx. The best time for residents of the Southwest to observe Comet NEAT is 75 minutes after sunset. To find it, face slightly to the right of west and search a 25° wide section of sky from 45 to 55° above the horizon. Look for a circular, glowing cloud. Ginger Mayfield captured this image of Comet NEAT on May 10th from Divide, Colorado. 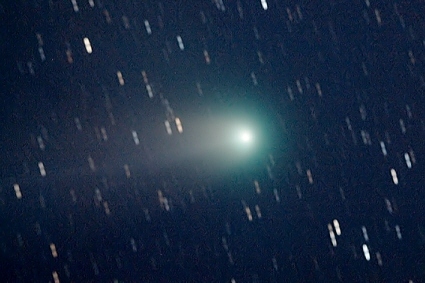 Note the comet's blue-green color and faint tail. Copyright 2004, Ginger Mayfield. Used with permission. A panorama taken by the Mars Exploration Rover Opportunity of the impact crater Endurance. Rocks in the crater's vertical walls may provide clues into the planet's history - provided the rover can get to them. Flight controllers are working on ways to overcome this obstacle. Image courtesy of NASA/JPL/Cornell University. (MAY 9) Long-awaited Comet NEAT is now well placed for observation in the evening sky. The object is visible from the suburbs using binoculars and from remote areas with the unaided eye. 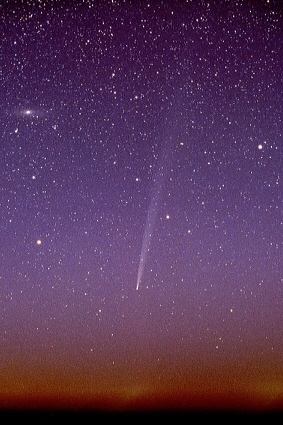 The best time for residents of the Southwest to spot Comet NEAT is 1 hour 15 minutes after sunset. Face midway between southwest and west and scan the sky in wide swaths from left to right from 20 to 45 degrees above the horizon. The solitary, moderately bright star Procyon is within the search area and serves as a good landmark. The comet will resemble a faint, glowing cloud. Depending on your location and equipment, you may be able to see the star-like nucleus or a hint of a tail. Discovered only a month ago, Comet Bradfield emerged from the Sun's glare last week. Nearly invisible from the suburbs, the comet provided a pre-dawn spectacle for observers far from city lights. Amateur astronomer Tom Teters shot this telephoto image of Comet Bradfield from Cactus Flats, Colorado on the morning of April 27th. The white smudge in the upper left is the Andromeda Galaxy (M 31). Copyright 2004, Tom Teters. Used with permission. (APR 26) NASA's Jet Propulsion Laboratory in Pasadena, Calif., will hold an open house on Saturday and Sunday, May 15th and 16th, taking visitors on a virtual ride through the solar system with this year's theme, "The Spirit of Exploration." A Delta II rocket carrying NASA's Gravity Probe B spacecraft heads downrange following lift-off from Vandenberg AFB. Image courtesy of Bonnie Walters. Used with permission. 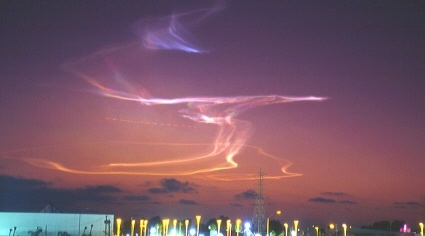 The pastels of evening twilight form a background for the rare dusk launch of a Minuteman III from Vandenberg AFB on 2002 September 19. Minuteman III ICBMs are usually test-fired at night, but a series of coincidences caused this missile to be launched after sunset. The optimal lighting conditions made the launch visible across much of the Southwest. The webmaster took this photo from Vandenberg AFB. It is one of several images he captured of this impressive launch. Close-up of an image taken by aviation enthusiast Jay McKee showing NASA's X-43 hypersonic research vehicle enroute to the launch point prior to its record-breaking flight on March 27th. 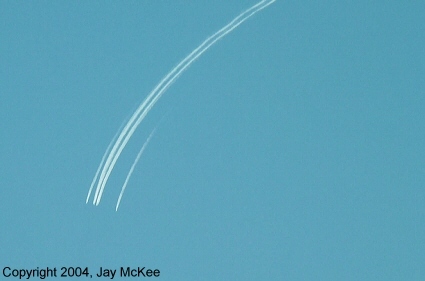 The photo shows a B-52 carrying the X-43 (wide double contrail) and F/A-18 chase planes (short contrails) flying in formation. McKee observed the hypersonic flight test from a vantage point above the coast on the Los Angeles County - Ventura County line. Used with permission. A B-52 bomber carrying NASA's X-43 hypersonic research vehicle leaves Edwards AFB on March 27th. The B-52 later released the X-43 over the ocean southwest of Los Angeles. A rocket boosted the craft to the edge of space and the X-43's scramjet engine accelerated it to Mach 7. Image courtesy of Brian Lockett. Used with permission. (MAR 26) Weather permitting, well-placed observers in southern California should have an opportunity to view Saturday's X-43 flight test. Two F/A-18 chase planes and the B-52 bomber carrying the X-43 are scheduled to take off from Edwards AFB around noon, fly west, cross the coast near Santa Barbara at about 12:25, and fly to the launch point west of Los Angeles. Launch will occur about an hour after takeoff. After launch, the planes will likely return to Edwards along the same route. Observers may catch a glimpse of the three aircraft as they head to and from the launch point. With some luck, the smoke trail from the X-43's solid rocket motor will also be visible. For the best view, find a location along the coast that's above any low clouds and fog. Two good locations are East Camino Cielo in mountains north of Santa Barbara and the end of Crenshaw Boulevard at the top of the Palos Verdes peninsula. If you plan to drive to East Camino Cielo, use great care. The road isn't maintained and has dangerous drop-offs. Amateur radio operators might hold a launch net on the 147.000 MHz Santa Barbara repeater on Saturday to follow the test and discuss the event. (MAR 25) Suitably equipped observers have an opportunity to see a rare planetary phenomenon this Sunday morning, March 28th. From 00:00 to 00:19 PST (March 28th 08:00-08:19 UTC), the shadows of Jupiter's moons Io, Ganymede, and Callisto will simultaneously cross the planet's disk. At the same time, the disks of Io and Ganymede will also be passing in front of Jupiter and Ganymede's dark disk may resemble a fourth shadow. (MAR 24) This morning's test launch of an unarmed Minuteman III missile from Vandenberg AFB was cancelled due to technical problems. The ICBM was scheduled for launch at 00:01 PST, the start of a six-hour launch window. But before the launch window opened, the countdown was already in an unscheduled hold at T-14 minutes. A GPS-based system on the Minuteman designed to send the vehicle's position to tracking stations on the ground wasn't working properly. The problem appeared to be solved and the countdown was resumed for a 01:04 PST launch attempt. However, the count was abruptly halted moments before launch when the tracking system began acting up again. The launch was eventually cancelled at 02:55 PST. A new date for the launch has not been announced, but the Air Force said it would occur no earlier than next week. Jason Hatton of Mill Valley, California recently captured Venus' elusive atmospheric markings by imaging the planet in ultraviolet light. For decades observers have reported seeing very subtle features on Venus' otherwise featureless disk. The markings were found to be more apparent in UV, but ultraviolet imaging was difficult until the advent of CCD cameras. 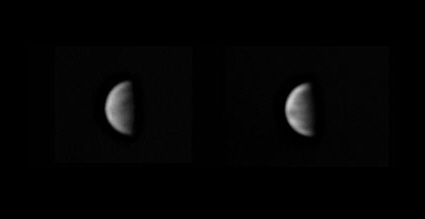 Hatton took numerous images of the planet on the evenings of March 7th (left) and 8th (right) with his 9.25-inch Schmidt-Cassegrain telescope, CCD camera, and UV filter. He combined them to bring out the markings. Images Copyright 2004, Jason Hatton. Used with permission. (MAR 18) Observers on the West Coast will be treated to a pair of dual jovian shadow transits this week. The shadows of Jupiter's moons Io and Europa will be visible as they cross the giant planet's cloud tops on March 19th at 03:10 PST (March 19th 11:10 UTC). The shadows of Io and Ganymede will make a similar transit on March 20th at 21:39 PST (March 21st 05:39 UTC). The aftermath of a Vandenberg AFB rocket launch as seen from San Diego. Michael-Leonard Creditor took this dusk photo in 1993 July. He had never seen a Vandenberg launch before and adds "I looked at the sky, gasped, pulled over and started shooting." Image Copyright 1993, Michael-Leonard Creditor. Used with permission. 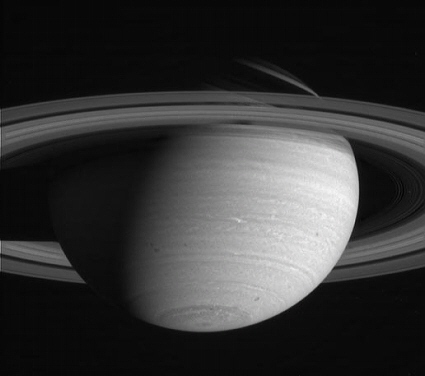 The Cassini spacecraft captured this image of Saturn with a special filter tuned to a near-infrared region of the spectrum where methane absorbs light. Dark areas are places of strong methane absorption, relatively free of high clouds; the bright areas are places with high, thick clouds which shield the methane below. The image reveals a high, thick equatorial cloud and a relatively deep or thin haze encircling the pole. Image courtesy of NASA/JPL/Space Science Institute. (MAR 4) Amateur astronomers report the appearance of a subtle, elongated bluish feature in Jupiter's atmosphere. The blue stripe is located between the planet's Equatorial Zone and South Equatorial Belt and spans 40° of longitude. Observers report the new feature is easiest to see near Jupiter's limb. The stripe crosses the planet about two and a half hours before the Great Red Spot. To determine when this new feature will be visible, refer to the list of Great Red Spot transit times in Sky and Telescope magazine and adjust the times accordingly. Observers in western North America may be able to spot this new feature during the next several days at the following times (dates and times are PST): MAR 4 21:24, MAR 6 03:10 and 23:02, MAR 9 00:40 and 20:31, and MAR 11 22:09. (MAR 2) International Launch Services, a Lockheed Martin Corp. joint venture, has received the go-ahead for the first Atlas V launch from Vandenberg AFB. The launch will occur from SLC-3E, which is being refurbished to support a late 2005 launch for this national security mission. The launch is for the National Reconnaissance Office (NRO), as one of 18 missions assigned to ILS and the Lockheed Martin-built Atlas V rocket under the U.S. Air Force's Evolved Expendable Launch Vehicle (EELV) program. Information courtesy of International Launch Services. 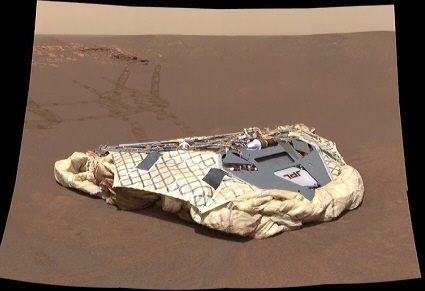 The Opportunity Mars Exploration Rover looks back at its now-empty lander. This mosaic of 12 color images was taken by the rover's panoramic camera at 13:00 local Mars time. Image courtesy of NASA/JPL/ Cornell University. (FEB 26) A spaceborne laser instrument launched last year from Vandenberg AFB is poised to help scientists answer important questions about Earth's surface. (FEB 24) A brief Jupiter dual satellite transit occurs on February 26th between 21:37 and 21:39 PST (February 27th between 05:37 and 05:39 UTC). Suitably equipped observers should be able to see the disks of Jupiter's moons Io and Europa in front of the planet and Io's shadow on Jupiter's cloud tops. (FEB 22) Professional astronomer Sanjay Limaye of the University of Wisconsin is asking amateur astronomers worldwide to image Jupiter on the same day. The date is February 28th 16:00 to February 29th 15:59 PST (February 29th 00:00 to 23:59 UTC). Limaye is attempting to create a map of the jovian atmosphere. Please send images to Richard Schmude, Jupiter coordinator for the Association of Lunar and Planetary Observers at schmude@gdn.edu. 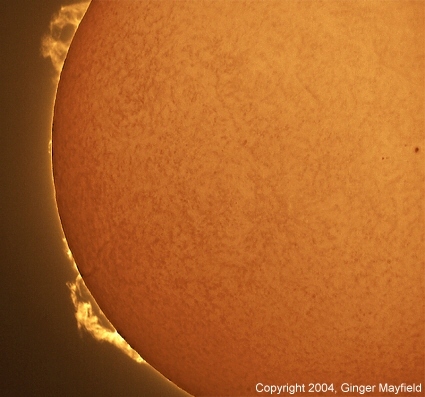 Solar observer Ginger Mayfield took two telescopic images of the Sun in hydrogen alpha light on Valentine's Day and combined them to create this composite. Prominences on the Sun's limb are clearly visible along with detail on the solar disk. Taken on 2004 February 14 from Divide, Colorado. (FEB 15) The February 21st reflight of NASA's X-43A hypersonic research vehicle appears to have been delayed for at least a week due to a booster software issue. Designed to demonstrate air-breathing engine technology at speeds above Mach 5, the unmanned X-43A is now scheduled to fly no earlier than February 28th. Plans call for a B-52 bomber to carry the X-43A/Pegasus booster stack from Edwards AFB to the launch point offshore from Los Angeles. After release from the bomber, the Pegasus booster will ignite and push the X-43A to its operating altitude of 95,000 feet. The booster and X-43A will separate and X-43A's scramjet engine will operate for several seconds, accelerating the craft to a speed of about Mach 7. 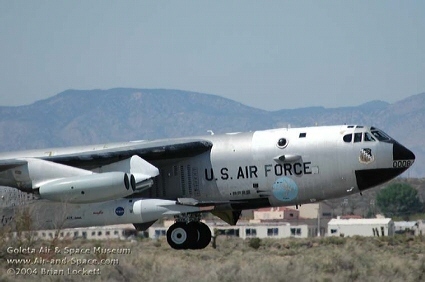 The X-43A's first flight occurred in June of 2001. The release from the B-52 was normal, but the flight was terminated by ground controllers when the Pegasus booster/X-43A went out of control shortly after booster ignition. (FEB 3) Richard Schmude, Jupiter coordinator for the Association of Lunar and Planetary Observers reports there is currently a small dark spot on Jupiter. It is immediately south of the Great Red Spot and has just passed it. He told Space Archive that as of January 30th, this spot was still present but it may dissipate over the next two or three weeks. The spot is similar to jovian dark spots seen in 1990 and 1998. Schmude asks that observers keep a close eye on this feature and to send their observations to schmude@gdn.edu. To determine when the dark spot will be visible, refer to the list of Great Red Spot transit times in Sky and Telescope magazine. (FEB 3) On Friday evening, February 6th, Jupiter's moons Callisto and Ganeymede will simultaneously cross the giant planet's disk. Known as a dual satellite transit, the event occurs from 22:42 to 23:46 PST. At the same time, Ganymede's ink-black shadow will also move across Jupiter. The disks of the two moons passing in front of the planet and Ganymede's shadow should be visible in a moderate-size amateur telescope. The Moon and Mars will have a close encounter on Tuesday night, January 27th. Using little more than the naked eye, observers will be able to watch the Moon's eastward motion carry it 3° south of the red planet. Closest approach occurs at 19:00 PST. 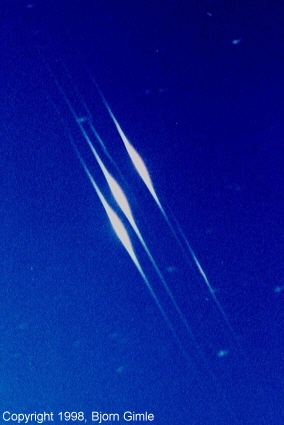 Bjorn Gimle captured the midnight sun reflecting off of several Iridium satellites four days after they were launched from Vandenberg AFB. Gimle took this time exposure from Tyreso, Sweden on 1998 May 21 at 23:59 UTC. 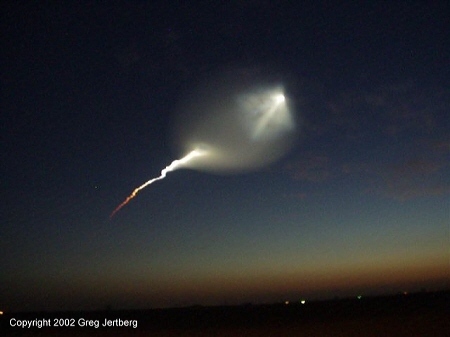 A fine image of the 2002 October 14 dusk launch of a modified Minuteman II missile from Vandenberg AFB. Taken by Greg Jertberg from Visalia, California. A three-stage booster designed for the Missile Ground-based Midcourse Defense System lifts off from silo LF-21 on North Vandenberg on January 9th. U.S. Air Force photo by Doug Gruben. Copyright © 2004-2016, Brian Webb. All rights reserved.